No matter how bad your day is, the sweet chirping of a songbird can pull you out of a funk. 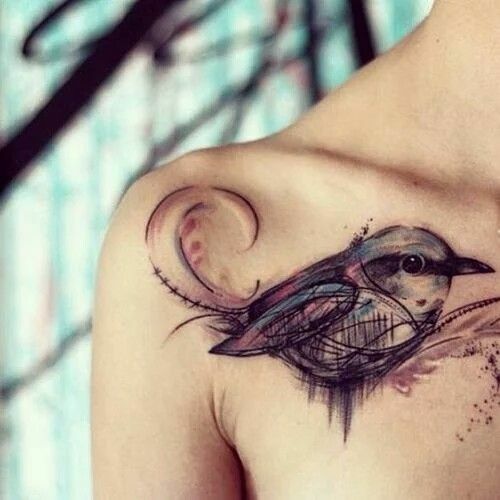 The bird’s song has been known as a symbol of springtime and new opportunities since man first started using symbols. The sound of a bird reflected all of the possibilities that the day could bring. Subconsciously, humans still listen for the first whistles of the birds that signify that morning has become. Throughout human history, people have been obsessed by the symbolism of birds. Many of the bird’s traits are things that human beings aspire to. Most of all, the freedom of flight symbolize the freedom that human beings want to change. From the earliest inventors in history, man has been obsessed with making flight possible. Inventors like Leonardo Da Vinci focused on ways that man could soar to the same heights as the birds do. Long ago, Abbas Ibn Firnas became the first person to try to fly like a bird. He designed a contraption that used material and feathers that would hopefully help him to fly. Jumping off the tallest building in his town, Abbas managed to glide for a short distance before crashing down. Unlike earlier flight attempts, Abbas survived his flight. In a different flight, one inventor swore that he could fly from the Eiffel Tower. Unfortunately, he did not survive the attempt and early videos show the horrific results of his failed test flight. For thousands of years, the dove has been a symbol of love and peace. In the bible, the dove is often involved in stores that involve God’s promises to his chosen people. Long ago, the dove was a symbol of the Canaanite mother goddess, Asherah. In Rome, doves were connected to Venus, the goddess of love and beauty. While the dove can represent your Christian faith, it can also be used to represent beauty, femininity, purity and grace. The bird of paradise is the diva of the avian kingdom. This bird is exceptionally outgoing and beautiful. In Papua New Guinea, this type of bird is considered a gift of god and is used in reverent rituals. These small animals are known for their elegance, grace and beauty. Like the hawk and the eagle, the falcon is recognized as a noble bird. It often represents the rising sun and new beginnings. Known for being an excellent hunter, the falcon is recognized for being exceptionally good at focusing on a specific task. With their focus and intelligence, the falcon is symbolic of man’s ability to remain committed to the goal despite any obstacles that are encountered. The crow or raven is at once a noble being and a complete evil doer. In Native American culture, the raven is thought to be a protector of a world that it helped to create. 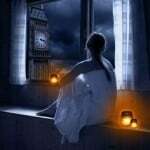 During each waking hour, it manipulates everyone around it in order to bring wisdom to the world. While the raven may be known for its misdeeds, it is also known for having a loving nature. 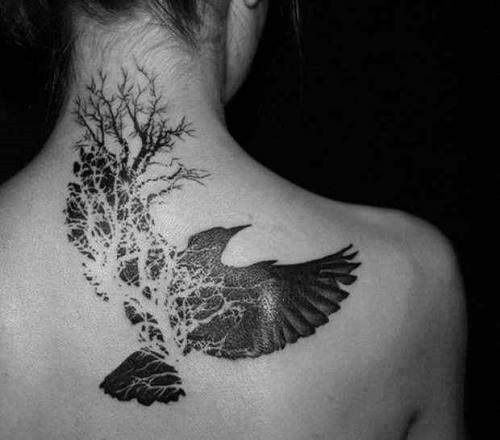 As such, a raven tattoo can represent protection, creation, renewal and intelligence. In Greek mythology, Zeus was associated with the eagle and the lightning bolt. Modern cultures often connect the eagle to masculine strength, wisdom, virility, power and spirituality. In Native American culture, eagles are thought to be messengers of god and powerful spiritual beings that are the incarnation of the spirit of the Thunderbird. In Japanese culture, the crane was thought to bring a blessed marriage and good fortune. The Japanese had a tradition of folding 1,000 origami cranes as wedding presents to bring good luck. After a Hiroshima survivor, Sadako Sasaki, folded these cranes to bring peace, the tradition became even more popular. The crane can represent happiness, prosperity, love, hope, peace, purity and new opportunities. While larks may be small, they are extremely common in Western Europe and England. These lovely birds awake with the dawn, which is why they are used to symbolize good fortune, hope and new opportunities. Known for its beauty, the lark has been used by famed writers like Shakespeare and Chaucer. 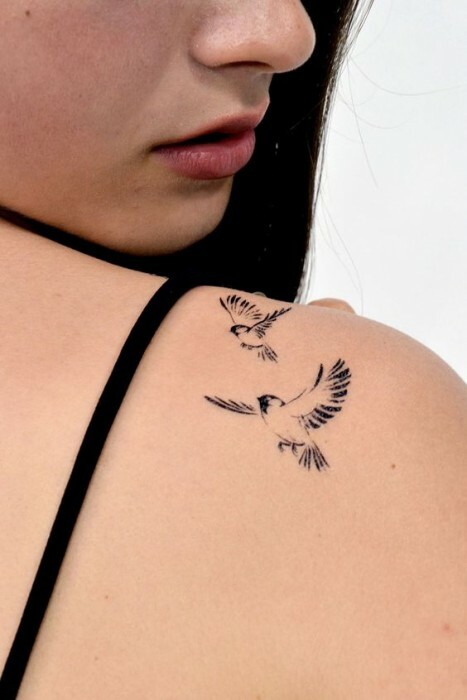 In addition, these birds symbolize the arrival of new chances, renewal and good fortune. The Sankofa tattoo is an African concept that is used in cloth, fashion, jewelry and tattoos. This spiritual symbol is a sign that humans should learn from their past in order to create a better future. 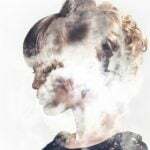 Regardless of where you are from, the ability to learn from mistakes is a trait that can resonate across all cultures. Known for being passionate and fiery, cardinals can bring light into the coldest winter days. Recognized by their bright colors and vibrant songs, cardinals are a symbol of vitality, youth, energy, joy, happiness and passion. Since they are known for being extremely territorial, the cardinal can also be a symbol of duty, loyalty and family. In Germany, they are also a symbol of Christmas. The ancient Aztecs believe that the hummingbird would give the wearer strength and energy because of the hummingbird’s amazing ability to beat its wings eighty times per second. In the Caribbean, this bird is also a symbol of grace and beauty. It is also known for its passion, energy and vitality. The lustrous, flashy flamingo is a popular tattoo design. This bird gets its color from a diet that is rich in beta-Carotene. Known for elegance, grace and beauty, the flamingo was revered in ancient Egypt as a symbol of the sun god, Ra. In addition, they are symbols of energy, vitality and beauty. While some traditions revere the owl as an insightful bird of wisdom, the owl is sometimes feared as a sign of death and misfortune. Across many cultures, the owl is seen as a spiritual guide that connects humans to the other realm. Tattoos of the owl often represent a deeper understanding of the mysteries of life, intelligence and truth. 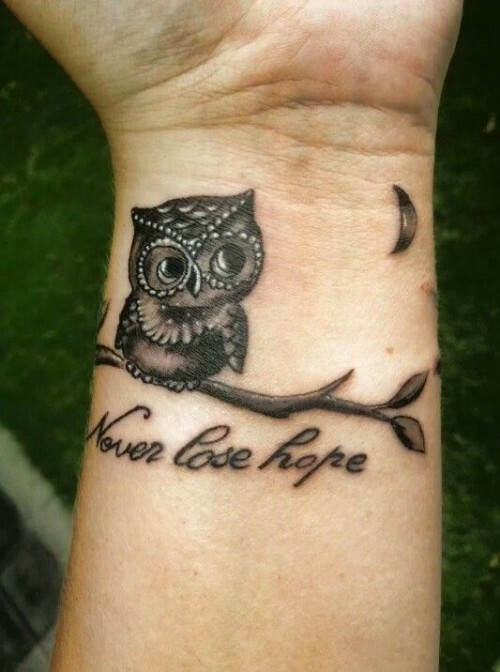 Aww that cute owl tattoo design really won my heart. 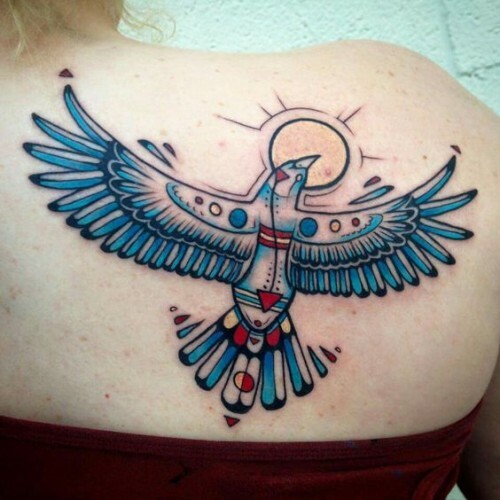 Thanks for sharing such neat and sweet bird tattoo design. Thank you for sharing your thoughts! It is great to see that our readers are enjoying our articles. Have a great day, Bella!